One of my goals this year is to send more queries, specifically to send one a month to an agent or editor. While this may not seem like much to some writers, for me it will be about a 200% improvement (perhaps more — math isn’t my strongest subject). Since I’ve been writing, my approach to queries and pitches has been haphazard at best. But it’s time to take this part of writing as a career as seriously as I take the actual writing of a book. With this in mind, tonight I sent a query for a book I finished a few years ago. I also started an Excel spreadsheet to keep track of queries and responses. In the process, I discovered that of the ten queries I’ve sent, either blind or after pitching at a conference, three received nice rejections. Of course, I also got three form rejections, one in-person rejection, and two queries received no response at all. It’s also interesting to note that the two queries which got no response were both for partial manuscripts that had been requested when I pitched at a conference. I’m heartened by these statistics; three encouraging rejections out of ten isn’t bad. It helps that I’m an optimist with at least a small amount of confidence in my own abilities. Also, I work in a library where I select books for about one hundred people a month. Every day, I see the vast spectrum of people’s reading tastes. I also see how it can change, sometimes dramatically. I’ve said it before, and I’ll say it again, agents and editors are human, and every human is unique. Therefore, editors and agents — like you and me — have unique preferences for what they like and don’t like to read, represent and publish. So, I try not to take rejection personally. I’m pretty sure the agents and editors I’ve queried don’t mean it that way. A rejection doesn’t mean they hate me, or even my writing. It means they don’t see a place for it in their lineup. 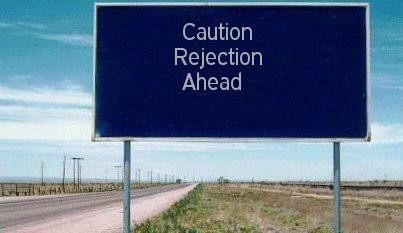 Addendum: For a look at rejection from an agent’s perspective, check out the links below. Both are well worth the visit. This entry was posted in Rave, Writing and tagged Publishing, Queries, Query letter, Rejections, Writing. Bookmark the permalink.